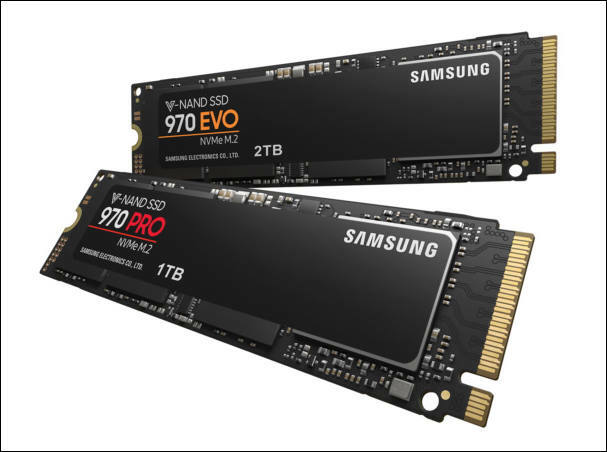 Samsung Electronics, today introduced the Samsung 970 PRO and EVO, the third generation of its industry-leading consumer solid state drive (SSD) lineup. Having led the market with the first consumer-focused NVMe SSD in 2015, Samsung continues to push the performance barriers with this latest generation of SSDs that are built for tech enthusiasts and professionals so that they can enjoy higher bandwidth for intensive workloads on PCs and workstations. "Samsung has led the NVMe SSD industry since its inception, and the company continues to define the latest standards of consumer storage with unprecedented performance of the 970 PRO and EVO SSDs," said Un-Soo Kim, senior vice president of Brand Product Marketing, Memory Business at Samsung Electronics. "The 970 series sets a new bar in all aspects for the NVMe SSD market with groundbreaking performance, superior reliability and best-in-class capacity." The Samsung 970 PRO and EVO are designed based on the M.2 form factor standard and with the latest PCIe Gen 3×4 lane interface. The 970 series maximizes the potential of NVMe bandwidth, delivering unparalleled performance for processing large volumes of data, including 3D, 4K graphics work, high-end games and data analytics. The 970 PRO enables sequential read speed of up to 3,500 MB/s and sequential write speed of up to 2,700 MB/s^1^, while the EVO features sequential read speed of up to 3,500 MB/s and sequential write speed of up to 2,500 MB/s^2^. The sequential write speeds represent an enhancement of up to 30 percent over the previous generation^3^, thanks to Samsung's latest V-NAND technology and the newly designed Phoenix controller. The 970 EVO, in particular, utilizes the Intelligent TurboWrite technology, which uses a large buffer size of up to 78GB^4^ to enable faster write speeds. In addition to the advancements in performance levels, the 970 PRO and EVO deliver exceptional endurance and reliability. Featuring a five-year warranty^5^, or up to 1,200 terabytes written^6^ -- 50 percent higher than those provided for the previous generation^7^ -- the 970 PRO and EVO are built to last. The Dynamic Thermal Guard technology safeguards against overheating by automatically monitoring and maintaining optimal operating temperatures, while a heat spreader and new nickel-coated controller further lower the SSD temperatures. The 970 PRO and EVO also provide greater system design flexibility for the high-performance computing systems. Offering a variety of high capacity options in a compact M.2 form factor -- including the single-sided 2TB EVO model -- the 970 series enables convenient storage expansion across a wide range of computing devices. The 970 EVO will be offered in 250GB, 500GB, 1TB and 2TB^8^ capacities, and the 970 PRO in 512GB and 1TB capacities. The 970 PRO and EVO will be available for purchase worldwide starting May 7, 2018, with manufacturer's suggested retail prices starting at $329.99 and $119.99 USD, respectively. For more information, including warranty details, please visit www.samsung.com/SSD, www.samsungssd.com. ^1^ 970 PRO and EVO performance may vary based on SSD's firmware version, system hardware and configuration. Performance measurements based on IOmeter 1.1.0. *Test system configuration: Intel Core i7-7700K CPU @4.2GHz, DDR4 2400MHz 32GB, OS-Windows 10 Built 10240, Chipset--ASUS PRIME Z270-A. ^2^ Performance may vary based on SSD's firmware version, system hardware and configuration. Performance measurements based on IOmeter 1.1.0.\ Write performance measurements are based on Intelligent TurboWrite technology.\ The sequential write performances after TurboWrite region are: 300 MB/s(250GB), 600 MB/s(500GB), 1,200 MB/s(1TB) and 1,250 MB/s(2TB).\ The random write performances after TurboWrite region are: 80,000 IOPS(250GB), 160,000 IOPS(500GB) and 300,000 IOPS(1TB/2TB).\ * Test system configuration: Intel Core i7-7700K CPU @4.2GHz, DDR4 2400MHz 32GB, OS-Windows 10 Built 10240, Chipset--ASUS PRIME Z270-A. ^3^ Up to 29% and 32% in sequential write speeds, respectively, have increased when compared to Samsung 960 PRO and EVO. ^4^ 970 EVO Intelligent TurboWrite buffer size varies based on the capacity of the SSD: 13GB for 250GB model, 22GB for 500GB model, 42GB for 1TB model and 78GB for 2TB model. For more information on the TurboWrite, please visit www.samsungssd.com. ^5^ Five years or TBW, whichever comes first. For more information on the warranty, please find the enclosed warranty document in the package. ^6^ Warrantied TBW(Total byte written) for 970 PRO: 600TB for 512GB model, 1,200TB for 1TB model; Warrantied TBW(Total byte written) for 970 EVO: 150TB for 250GB model, 300TB for 500GB model, 600TB for 1TB model, 1,200TB for 2TB. ^7^ 50% increase when compared to Samsung 960 PRO and EVO. ^8^ 1GB=1,000,000,000 bytes by IDEMA. A certain portion of capacity may be used for system file and maintenance use, so the actual capacity may differ from what is indicated on the product label. These are becoming so fast I wonder if CPU is now the bottle neck.